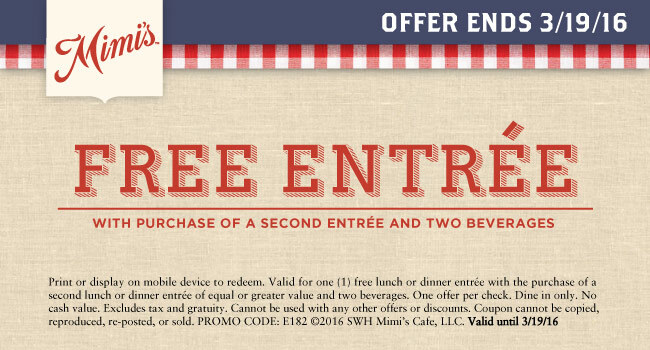 Mimi’s Café is offering a FREE lunch or dinner entrée with the purchase of a second entrée and two beverages! Simply print this coupon and present it to your server to receive the discount. Offer valid through March 19, 2016 at participating Mimi’s Café locations. Dine-in only. Cannot be used with any other offers or discounts. Most Mimi’s Café locations will be open regular hours on Good Friday, March 25 and open holiday hours Easter Sunday, March 27. This is what I call “Cheap Filet-O-Fish Season.” It’s that magic time of year between Fat Tuesday and Easter Sunday when McDonald’s drops the price of their Filet-O-Fish sandwiches at many locations across the U.S. I have good news and bad news for the current Lenten season. First, the bad news: I have seen fewer deals this year vs in the past. The special spring Filet-O-Fish offer is not a national promotion. Pricing and availability varies by restaurant and region. So far, there just aren’t as many discounted deals this year as there used to be. Hopefully, this will change as we get closer to Good Friday and Easter Sunday. Most of the Los Angeles metro area restaurants are honoring this promotion. If one fish sandwich isn’t enough but two are too much, you can add an extra fish patty for just $1.00. Don’t miss $1.79 Filet-O-Fish Fridays, available through Good Friday 2016 at participating southern California McDonald’s restaurants. Four years ago, McDonald’s began offering their legendary Shamrock Shake at all 14,000 restaurants in the U.S. The Shamrock Shake special has been available on and around St. Patrick’s Day since 1970, but only in certain markets and at specific locations. How long does McDonald’s sell Shamrock Shakes? For 2016, the minty-green delights will be available through the second half of March. Actual sale dates vary by market. How much does a Shamrock Shake cost? That also varies by region and location. A common promotional price seems to be $1.99 for the small (12 ounce) size. Medium and large Shamrock Shakes will cost more, of course. As you probably know, all McDonald’s shakes are now served “McCafe style” in clear plastic cups instead of the paper cups used previously. All shakes are also now topped with whipped cream and a cherry, making them look more like a dessert. St. Patrick’s Day only comes once a year, so go ahead and enjoy a McDonald’s Shamrock Shake while they last!